Swiss architecture firm Bureau A has created Steelhenge: a recreation of the prehistoric English stone circle built from 50 shipping containers. For the first edition of the biennale for independent art spaces in Geneva, BIG, local firm Bureau A was commissioned to create an open air venue that would function as a space for attendees to congregate. 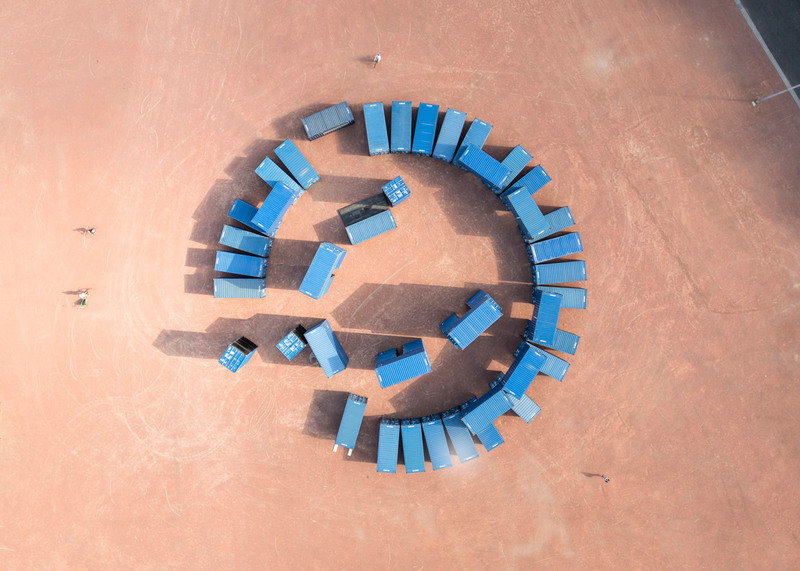 Constructed using 50 blue shipping containers, the circular arrangement of Steelhenge is based on the concentric layout of Neolithic monument Stonehenge. "We like to work with references, displacement or even direct quotes," Bureau A's Leopold Banchini told Dezeen. "In this case, the ruins of Stonehenge and the pagan rituals that it evokes seemed like an interesting landscape relating to the disappearing alternative and squat culture in Geneva." The steel containers were placed side by side to recreate the outer circle of monoliths. To echo the taller structures of the Wiltshire monument, pairs of containers have been stood on end to support horizontally-placed units. "The biennale was only organised for a long weekend," Banchini added. "With a restricted budget, we had to go for a fast and easily reusable material: the container." Others have also taken advantage of shipping containers' ease of use. Pedro Barata e Arquitetos Associados used them to build a 12-metre-tall periscope in Brazil, and CRG Architects proposed replacing slum housing with skyscrapers built from stacks of the containers. "Containers are a symbol at the new globalised economy; it was also interesting to replace the stones of the original monument by these steel box," said Banchini. The entire structure was built in a day using a crane, with concrete blocks used to add weight to each container, and reinforce their stability. Gallery participants in the biennale, which ran from 26 to 28 June 2015, were then given the opportunity to customise the interior of each of the containers. More design with shipping containers is collected together on Dezeen's dedicated Pinterest board. Photography is by Dylan Perrenoud.